Airport Retailers need traffic for their omni-channels, airlines like to maximise their Ancillary Revenues, will “the twain” ever meet? Will that Quartet of Airlines, Airports, Retailers and Brands eventually come together to offer the Consumer what he wants for his Journey? With more Travel Retail Stores offering digital pre-order facilities, Travellers now want to see all the shopping opportunities for their trip in one easy place. In early 2017 Travel Retail Traffic™ was born out of the website dutyfreeonarrival.com which was first launched in 2008 as a concept website. At that time, with a very basic global Airport & Airline Shopping Guide. The purpose of the site* was to advise Consumers as to where they could buy their “Duty Free on Arrival“, a little known concept to those in Europe or North America, but with the huge convenience of not having to carry the goods with you around the globe. Such a practice avoids many of the pitfalls experienced by travelers, like the numerous confiscations by Airport Security. Later in 2010, the database was extended, with the addition of land border, downtown and maritime shopping information for travelers and thus providing all the different purchase options available. 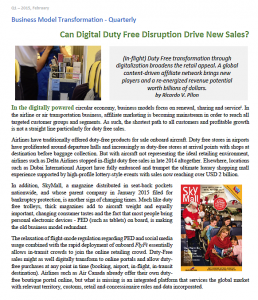 Today in 2017, the online Travel Retail shopping market is moving on and now airlines and airports are finally talking about joining forces to integrate retail offers to consumers with the best available duty free deals, at the right time. And, with many more convenient delivery options – including those available “on arrival”. Some Operators are even talking about home-delivery now, but within most Customs regulations, there are restrictions on what you can buy. (Mostly within Europe, alcohol and tobaccos** cannot be included for delivery to your property they must be exported personally by the passenger). 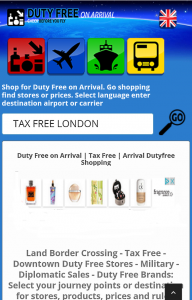 Now, dutyfreeonarrival.com is developing Travel Retail Traffic™ and addressing the new digital era for shopping, soon we intend to integrate our store data with airline information, so to maximise the passenger air traffic data, for better and easier shopping. What will this do for you, the consumer? It means that you will be able to find all the different shopping options on your journey and not just those in the airport or on your flight. It also means that you will be able to find the most convenient delivery options for your trip too and where allowed, the Tax Free refund services in Downtown stores and Outlet Malls. Travel Retail, (better known as Duty Free Shops), has tended to resist digital change until now, just as airlines have been very selective with their air traffic data related to passengers’ journeys. But this is changing now and the market is opening up. Everybody wants to generate ancillary revenues, but we want to put the consumer first. For almost ten years we have seen what you are searching for online and where, so the eventual Travel Retail Traffic platform will primarily focus on your needs and priorities, not theirs! Digital communication gives you more choice to find all your options for your trip, rather than just being “captive” in the airport. Look out for more developments soon and we will keep you updated as to our progress and if you have any ideas or suggestions as to what you would like to find when it comes to Travel Retail…. please let us know. Meantime, check before you fly at our global shopping and information directory for all the details related to your specific journey. * Before we launched our database for arrivals shopping, nobody had ever created such a directory for consumers. DFOA and our associates were the first to create this search facility by researching every territory in the world for the relevant Customs rules. We retain all this original correspondence and our research documents on file. Our databases and the global arrivals search mechanisms are copyright protected and original IP. ** Moving forward, this information will become a vital participant for the digital sales of home or airport "Duty Free" deliveries, because online sales portals will need to incorporate all the relevant Rules, before they can sell to you. Such Customs Rules are highly relevant to the delivery aspects of your goods, because in some Territories or Jurisdictions, the online or mail-order of so-called Duty Free sales is not permitted. 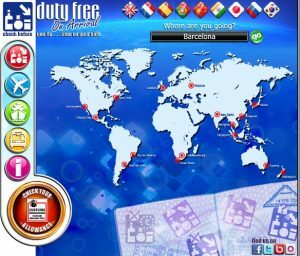 *** What is Duty Free? First published 11/8/2010 Explaining exactly what you are buying and whether it includes the tax or not. Is this the Airport Shopping Mall that got it right?